Performed in the summer of 2013. For 54 years, PCPA has been presenting exemplary theatre and providing excellent training with a resident company of theatre professionals. From its beginnings in the fall of 1964 and first summer season in 1965, founder Donovan Marley laid the ground work for a year-round professional theatre company in Santa Maria. 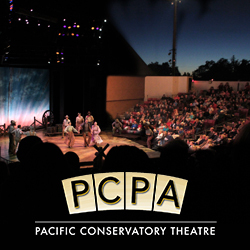 And, in 1974 the community of Solvang built the Solvang Festival Theater to enable PCPA's professional productions to be performed under the stars all summer. The 2018 summer season includes The Hunchback of Notre Dame, Vanya & Sonia & Masha & Spike, Mamma Mia! and Arcadia.